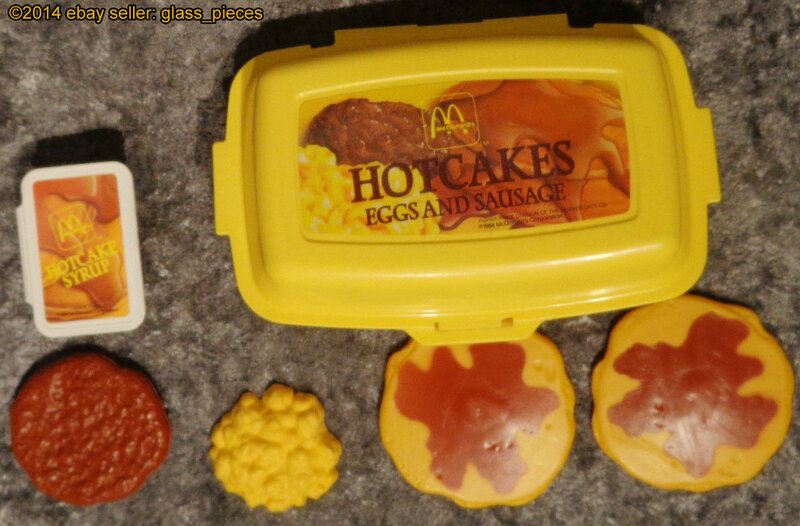 Description: This McDonald's® pretend food set includes hot cakes, sausage, and scrambled egg. All of the breakfast food fits into a breakfast container. Designed for children ages 3 to 7 years old. FPT7058 - Yellow plastic rectangular "styrofoam" Big Breakfast container with a hinged lid. Top of lid is marked "McDonald's HOTCAKES, Eggs & Sausage". Bottom inside of container is marked, "Fisher-Price". 2 each - FPT7059 - Round light brown pancakes with pretend dark brown syrup poured on top. 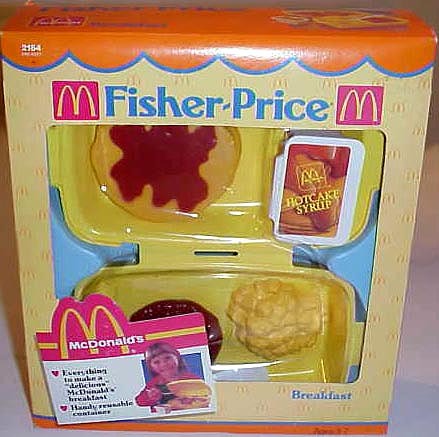 FPT7060 - Small white rectangular plastic container with a flip-up lid and a picture on top of the lid marked "McDonald's HOTCAKES SYRUP" in yellow. FPT7061 - Small round dark brown plastic sausage patty that looks like a real cooked McDonald's sausage patty. 2 each - FPT7232 - Yellow rounded plastic scrambled egg textured to look like real scrambled eggs. FPT7063 - This set was sold in a 8-7/8" long, 9-7/8" high, 2-7/8" deep display box.